There is still no end in sight for the hype-train that is everything Demna Gvasalia. The Georgian designer is French maison Balenciaga’s creative director, and ever since, the mens- and womenswear collections he’s sent down the runway have each had at least one buzzworthy piece to offer, with fashion press around the world chattering over how everything this man touches becomes an object of desire. And so, he did it again: Balenciaga has teamed up with Parisian concept store Colette for a temporary pop up installation, spawning a handful of exclusive products. One of these being the “Balenciaga Shopping Bag”. The rectangular tote was initially seen sported on the Men’s A/W ’17 catwalk. At first glimpse, it appeared (and still appears) to be Balenciaga-stores’ paper shoppig bag. The thing you get when you purchase an item. The thing you use for transportation, and throw away afterwards. Well, not anymore. 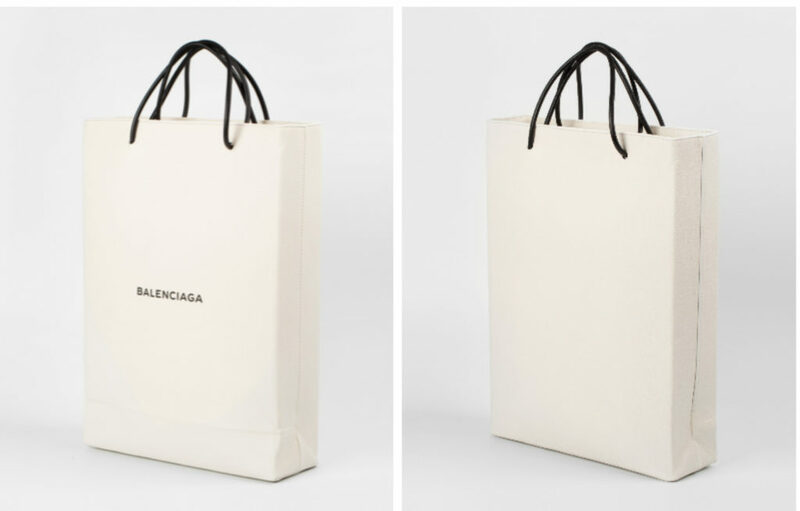 People are spending about and around 1100$ (995 Euro) for a Nappa leather version of Balenciaga’s minimalist “Shopping Bag”. Sure, this seems pretty farfetched at first, but then again, you have to remember this is a brand that, just recently, launched an IKEA-lookalike-tote with a similarly high price tag, just about broke the internet by doing so, and lastly, unvoluntarily made IKEA one of the streetwear trends of the season. But what about the Balenciaga Shopping Bag? Will it be just as successful? Well, get this: It’s already sold out! In case you were actually considering to buy the bag, though, you can sign up for the waiting list and be notified once it’s back in stock.